Gourmet Wine Dinner: "The Italian Table: Creating Festive Meals for Family & Friends"
On Wednesday, April 24, 2019, the Fourth Estate Restaurant at the National Press Club will host a dinner featuring Travel writer and cookbook author Elizabeth Minchilli will share her insights on Italian cuisine and culture at a five-course Italian dinner based on recipes from her book, "The Italian Table" at the Fourth Estate restaurant on April 24. Sign up NOW, as this will sell out quickly, as do all of these fun, great value wine dinners at the Press Club. celebrations at their own tables. The evening begins at 6:30 p.m. at the Fourth Estate restaurant with hors d'oeuvres featuring six different Italian specialties. Tickets are $95 per person, with a discount (90/person) when buying two ("couples") tickets. 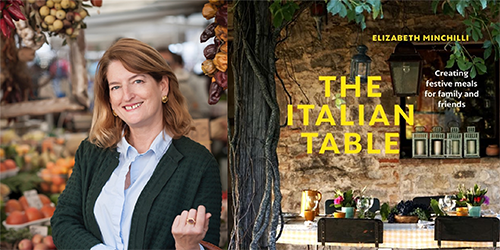 Meet Elizabeth Minchilli: "The Italian Table" is Elizabeth Minchilli's ninth book. and the style of the Tuscan farmhouse. shared her tips for exploring Italy's diverse regions -- from pizza in Naples to anchovies in Amalfi. The four-course meal will be from her popular recipes and paired with appropriate wines or other beverages. Single tickets are $95; couple tickets are 90/person, including all courses, beverages, tax, gratuity, copy of The Italian Table (one copy per single or couple).